Try Hearing Aids without Cost or Obligation. It's Simple and Free! Experience Better Hearing For Yourself! Deciding if you need a hearing instrument or which instrument is right for you is no easy task. Then the question is, will you like what you hear or be happy with it? Rest assured our professionals understand your concerns and are here to guide you every step of the way. Come in for a free hearing test and then Try Hearing Aids without cost or obligation. It’s that simple! 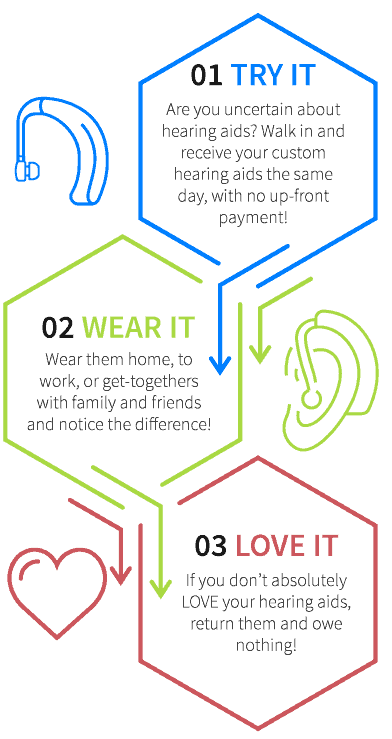 Come in and we will program a set of hearing instruments for you, and then wear the hearing aids at work, home or play and find out for yourself if they are right for you. Trying Hearing Aids first, before buying, is the best way to see if they will work for you. 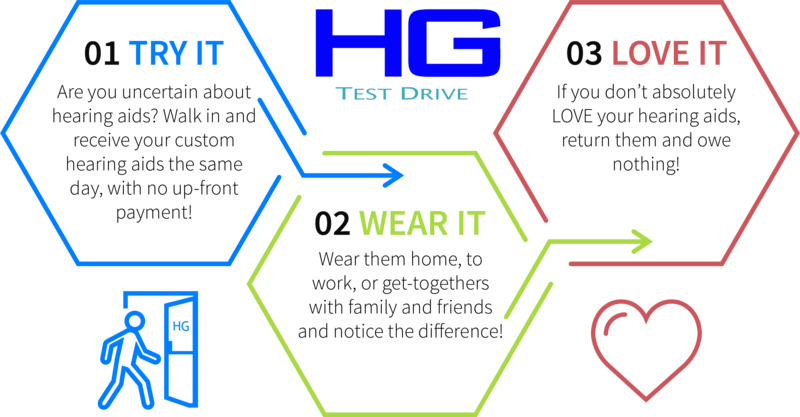 The HG Test Drive program is a unique program where you can try any technology you would like instantly. These hearing instruments are provided for you to try at no cost and are risk-free! And that’s it! If you are interested in learning more about the Hearing Group Test Drive program or would like to get started so you can try hearing aids today, please send us a message and we will happily answer any of your questions. You can also call one of our convenient locations nearest you!